Morning! We'll keep you up to date with details on the weather front that hit Cumbria overnight and is continuing to batter the county. One road blockage already being reported: Fangs Brow at Mockerkin, both ways at the Dub Beck junction, due to a fallen tree. In the couth of the county, tree surgeons are en route to Backbarrow after a tree fell on the A590. The tree has partially blocked the road near the Brow Edge Road junction. Drivers face delays in both directions. 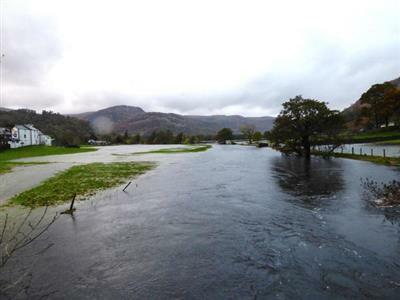 The Environment Agency has two flood alerts in place affecting Cumbria - the rivers Lowther and Eamont and Upper River Derwent, Stonethwaite Beck and Derwent Water. Top wind speeds so far this morning in Cumbria are 62mph at St Bees. Minor Flooding at Shap this morning. 5 Minutes delay for South Bound Services. The Met Office says gales of more than 55mph are likely inland with gusts of up to 70mph possible on some exposed coastal areas. "The public should be aware of the potential for disruption to travel and possible damage to trees. Difficult driving conditions will result, perhaps exacerbated by surface water and spray in places. "Some uncertainty remains in peak windspeeds but there remains the potential for disruption to travel, especially as the strongest winds coincide with the morning rush hour in places. Fallen leaves impeding drainage increases the risk of surface water affecting roads, while some damage to trees is possible, given that many are still in full leaf," adds the agency. The Met Office's strong wind warning is valid until 6pm today. GaugeMap showing there are 135 rivers across England and Wales - including a number in Cumbria - where flooding is possible: GaugeMap. Many more are 'within typical range', however. Met Office says that between 7pm yesterday and 7am today, 20mm of rain fell across county - but it was unlikely it would cause any flooding issues. 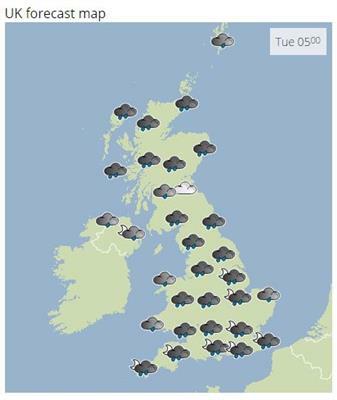 Thunderstorms, currently moving across Ireland, expected to arrive in Cumbria this afternoon. “It will gradually ease through the afternoon and then more significantly through the night. It’s going to be a blustery day but most of the persistent rain has gone,” said forecaster Simon Partridge.